If you're coming eastbound on the H-1 freeway thru Pearl City and Aiea, take exit 13B (Halawa Hts./Stadium). Stay in the right lane and take exit 1B (Halawa Hts./Halawa Valley/Stadium). Stay in the left lane at the fork and turn left on to Kahuapa'ani St. Get immediately into the right lane, follow the sign directing you to H-1 West/Pearl City/Halawa Valley and turn right on Ulune St. Continue on for about a hundred yards, and watch for signs directing you to Halawa Valley Industrial Park (a left turn at the next light). After the curve, the next intersection is with Iwa'iwa St. - turn left, and the immediate first road to the right is Iwa'ena Rd. - take that and go up about a tenth of a mile, the Church is a tan-and-white industrial building on the left with a parking lot in front. Go past the Kaneohe/H-3 exit and the next exit is 13A, labelled "78 West - Aiea". Go around the cloverleaf and you'll find yourself merging into Moanalua Road heading west (yes, that seems like the totally wrong direction, but remember that the HDOT designed this...). Keep to the right when Kamehameha Hwy splits to the left. The very next intersection is Kaimakani Street, turn right and go up the hill, across the freeway and turn right again on Ulune Street (See, NOW you're headed in the right direction!) 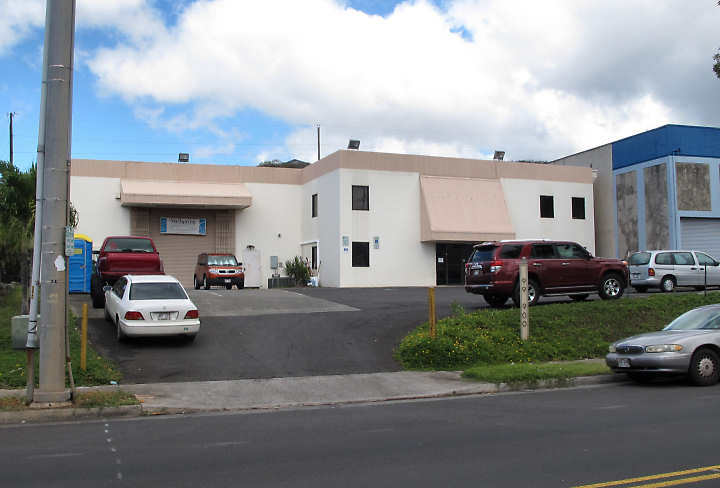 Continue east along Ulune St. until you come to the big, messy intersection with Kahuapaani St. Continue on straight thru for about a hundred yards, and watch for signs directing you to Halawa Valley Industrial Park (a left turn at the next light). After the curve, the next intersection is with Iwa'iwa St. - turn left, and the immediate first road to the right is Iwa'ena Rd. - take that and go up about a tenth of a mile, the Church is a tan-and-white industrial building on the left with a parking lot in front.. Go straight, and follow the directions above. As you reach the top of Red Hill, you want to be in the right lane, and get over into the Halawa/Stadium//Kaneohe off-ramp (Exit 1E). Go straight with the Halawa traffic, and turn right at the first traffic light (Halawa Valley Road). After a sharp curve, take the first left (Iwa'iwa Rd), then immediately the first right, which will put you on Iwa'ena Rd. Go up about a tenth of a mile, the Church is a tan-and-white industrial building on the left with a big parking lot in front. As you approach the end of H-3, you will see Exit 1C, labelled "Aiea - Halawa - Stadium". Turn right at the first traffic light after you exit the freeway. After a sharp curve, take the first left, then the first right, which will put you on Iwa'ena Rd. Go up about a quarter mile, the Church is a tan-and-white industrial building on the left with a big parking lot in front. © 2011 Hui Wa'a Kaukahi, Inc.